These Dan Dan Noodles are fast, incredibly delicious and so simple to make. Done in under 30 minutes, they are the perfect meal for those busy, busy weeknights. I’m sitting here typing this post, feeling super tired when I really have no reason to be. Now, my husband has every reason to be exhausted because he and his buddy rode LoToJa again this weekend. If you don’t know what it is, it’s a bike race from Logan, Utah to Jackson Hole, Wyoming. It’s 204 looooong miles (I can’t even image sitting on a bike for that long!) with a lot of climbing. I had the easy part. I drove to the feed zones, gave him fresh water bottles and food, and chit chatted with my friend while we ate candy corns and cinnamon bears (super healthy, right?) in the car. Now, if you’re feeling super tired, and want a quick and really simple meal, then these Dan Dan Noodles are for you. The sauce is so delicious and incredibly easy to make. I am a huge peanut butter fan so, of course, I loved the sauce. It’s sweet, creamy, and has just a slight kick. If you’re not a huge fan of peanut butter, don’t worry because it isn’t over powering, I promise. It’s kind of a funny name, I know, but don’t let that scare you away. 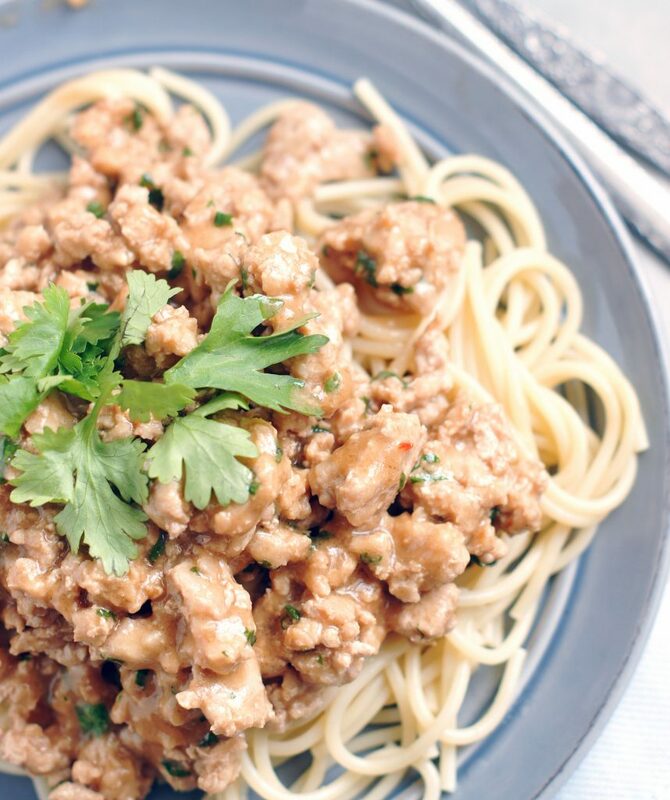 My boys loved this dish and hopefully, you will too. Cook the spaghetti until al dente, according to package directions. Drain and rinse with cool water. Return to the pot and set aside. For the sauce, in a medium bowl whisk together the broth, peanut butter, soy sauce, chile-garlic sauce, cornstarch, brown sugar, rice vinegar and sesame oil until smooth. Set aside. In a large skillet, cook ground meat, salt, pepper, garlic and ginger, and cook, until no longer pink, 6-7 minutes. Drain any grease. Return the skillet to stove top and pour the sauce over the meat mixture. Bring the mixture to a simmer and cook for 2-3 minutes until the sauce has thickened slightly. Stir in the chopped cilantro. 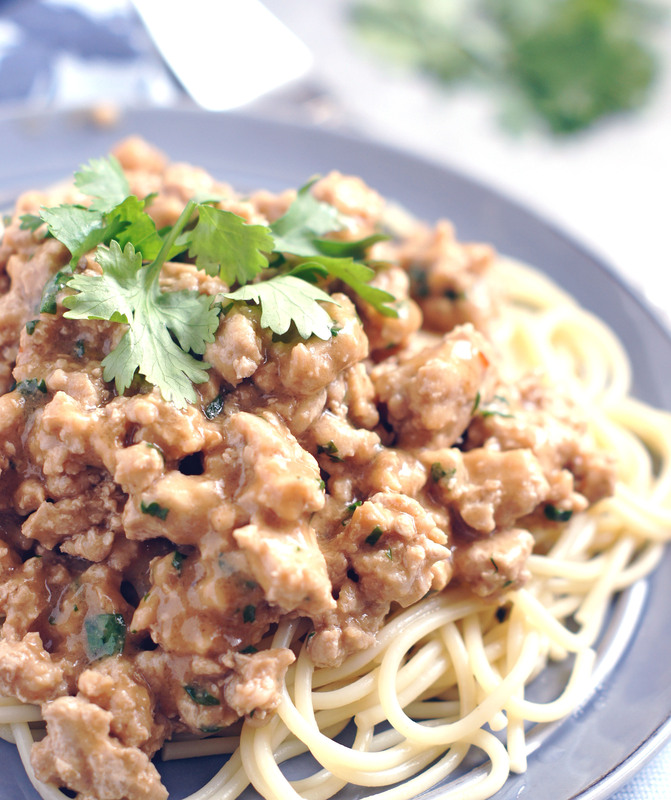 Spoon meat sauce over cooked noodles and serve immediately. Spicy and Fast!!! Gotta love that! Oh and delicious!